The main question is not whether to get the operation but what kind of replacement lens you want. Before 1949, if your vision started to deteriorate because of cataracts, you had to either wear the highest level of reading glasses you could find, seek out the brightest light or resign yourself to increasing blindness. But that year, surgeons at a hospital in London inserted the first lens into a patient’s eye with cataracts. Ever since, cataract surgery has become the cure for people whose eyesight has deteriorated because of a cloudy lens. Cataracts are part of the aging process, as our eye lenses become less transparent, less resilient and often thicker. Half of the population over 80 has cataracts. A cataract interferes with the retina’s ability to convert light into signals that are sent to the brain. At the start of cataracts, which develop slowly, things look blurred. When the condition becomes bad enough that it interferes with your daily life, your ophthalmologist can replace your cloudy natural lens with a clear artificial lens called an intraocular lens (IOL). Made of plastic, acrylic or silicone, the IOL becomes a permanent part of your eye. 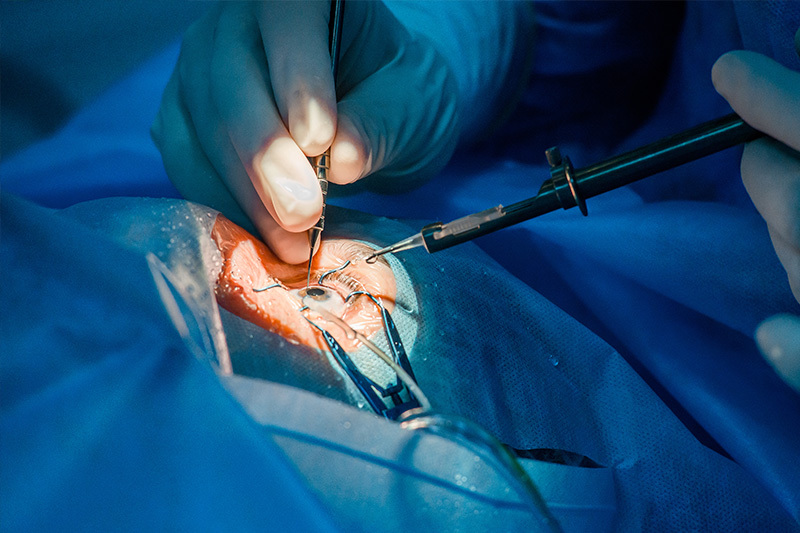 Surgeons choose from two different cataract surgery methods. Phacoemulsification, the most common, inserts a probe through a tiny incision in the front of your eye and then transmits ultrasound waves that break apart the cloudy lens. The surgeon removes the broken lens pieces and inserts a new lens. The second type of surgery, extracapsular cataract extraction, requires a larger incision to remove the cataract. The cataract operation has become so commonplace that surgeons do it on an outpatient basis in as quickly as 15 minutes. Normal sight returns within several days. The most effective prevention is not to get older. Since that’s not possible, here are other measures that can help you avoid or decrease the risk of getting cataracts. Have regular eye exams. These can detect other eye problems as well, such as glaucoma or macular degeneration, before they become serious. Wear sunglasses outside. This protects your eyes from harmful UVB rays, which increase your risk over time. Reduce alcohol use. Excessive drinking can increase the risk of cataracts. Eat foods rich in antioxidants. This includes fruits and vegetables. Some studies have shown that omega-3 fatty acids, such as those found in salmon and sardines, also reduce the risk of cataracts. Quit smoking. Research shows that smoking doubles your chances of developing cataracts. Keep diabetes in check. Studies show that diabetics have a greater likelihood of cataracts. There are basically two types of cataract lenses: monofocal and multifocal. Monofocal is the standard, with a single focus usually set for middle or distance vision. For fixed-focus monofocal lenses, the surgeon fits one eye with a lens for distance vision and the other for near vision. Another alternative is accommodating-focus monofocal lenses, which respond to eye muscle movements and shift focus to near or distant objects. The multifocal lens is similar to the progressive lens used in eyeglasses, with near, intermediate and distance vision available. Monofocals usually provide better intermediate vision (making it easier to see your computer screen, for example). Because of this, you might need to add a pair of eyeglasses for both near and distance vision. With multifocals, you will likely need only one pair of glasses, if any, to correct for eye weaknesses. In one survey of post-surgery cataract patients, 71 percent of multifocal patients users didn’t require glasses post-surgery, compared to only 26 percent for monofocal. With monofocals, you can alter your vision with different strengths of glasses, while with multifocals, you can’t take one lens away, because the lenses are part of the multifocal. Some people who got multifocals complained of disturbing visual symptoms, including halos or glare (known as dysphotopsia). Multifocal lens users can’t see contrasts as easily as the other group and may be unable to see details. This can be distracting and especially harmful when driving. People with monofocals have expressed more satisfaction about their lenses than have those with multifocals. Insurance typically covers monofocal lenses but not multifocals. Medicare covers your costs for monofocals if you test below a certain level of acuity or clarity. Private insurance plans may have similar vision requirements. Multifocal lenses are not recommended for those who suffer from certain types of corneal disease or who have brain disorders that affect the transmission of light, such as a stroke. Doctors say that one of the most important actions cataract patients can take to avoid post-surgery complications is to use the prescribed eyedrops. These consist of three types: antibiotic to prevent infections, and non-steroidal anti-inflammatory and steroid to reduce and eliminate inflammation. You will need to apply the eyedrops several times a day. Typically, patients start using the antibiotic drops a few days before surgery and afterward for about a week, and the anti-inflammatory drops for three to six weeks or longer in some cases. “Considering cataract surgery? What you should know,” October 2016, Harvard Women's Health Watch. “Cataract Surgery,” Nov. 15, 2016, American Academy of Ophthalmology. “What to Expect From Cataract Surgery,” WebMD. “A comparison of multifocal and monofocal intraocular lens implants used in cataract surgery,” March 06, 2012, PubMedHealth. “Monovision vs Multifocal IOLs for Spectacle Independence After Cataract Surgery,” March 03, 2014, Medscape. “The great debate: Monofocal vs. multifocal,” June 2011, ASCRS EyeWorld.